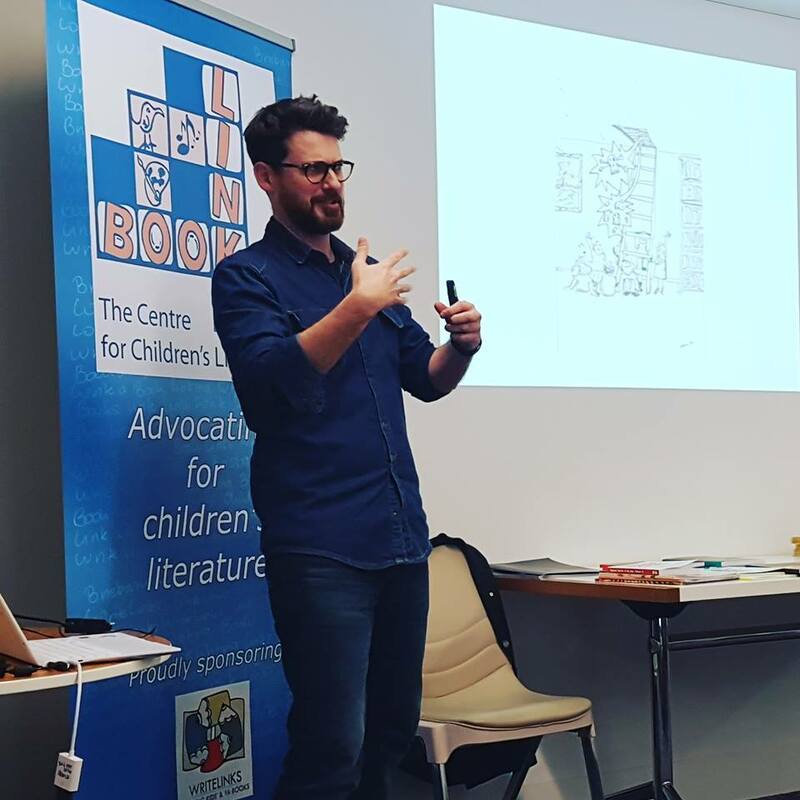 Can we dare to dream for a Centre of Children’s Literature in Queensland? Is it a building? Is it a desk to begin with in someone else’s building with a hub of activity radiating out from that point? What are its goals? Who are the clients? Where will it be located and why? Who are the stakeholders? How do we work with community to find out what they truly want and then make it happen? Non-profit? Fees based? Government grants pros and cons? What will happen in such a centre? On the 20th of June, around 40 participants from the Queensland community including: writers, librarians, universities, teachers, students, Book Links, children book council representatives, and Write Links members, gathered for a symposium for a children’s literature centre for Queensland. They were given four thought provoking case studies of different motivations and approaches that might be applied to a Queensland children’s literature centre. The symposium was sponsored by CBCA Qld Branch and The University of Southern Qld in partnership with Book Links Qld. The first was from Lesley Reece the founding Director and Chairwoman of the Fremantle Children’s Literature Centre (now called The Literature Centre), which she established in 1992, http://www.thelitcentre.org.au/; she shared the story of setting up the centre and maintaining and fostering its growth over twenty five years. Interestingly she played an instrumental role establishing respect for the Indigenous writers for children of Ireland which fuelled her passion for supporting children’s literature wherever she should live. The literature centre is a decommissioned prison which has been converted into a Children’s Literature Centre. Lesley shared some details of the various things the centre does which include having regular exhibitions of the process of the creation of picture books, taking these exhibitions on tour, hosting writers, and hosting talented students from schools throughout Western Australia for a regular all day workshop. They keep expanding and developing new programs but exhibitions on site and travelling to remote and isolated areas are a key part of what they do. Lesley encouraged participants to look at how to work with libraries and any partnership organisations they have access to. Lesley felt planning in Queensland would benefit from reflecting on the talents in the community and this would help everyone to work together as a team to achieve a centre. She said she still checks in on her team and their talents, goals to ensure they can grow and develop with the centre in Western Australia. It is so important that this team believe in each other, and in the vision for a centre. She related that everyone who is potential patron just changes into a definite sponsor when they see the centre in action; it just amazes them. Lesley emphasised that she was just a person passionate about writing for children. She humbly called herself a ‘nobody’ who set out to make a difference. The second case study was from Libby Gleeson AM, a beloved and respected Australian children’s author who has published over 30 books for children and teenagers; she spoke about West Words. http://www.westwords.com.au/about-us/ Libby said that the Centre in Western Australia inspired her to see what could be done in Western Sydney. Although they do want a physical centre at some point they began their journey less focused on a centre and more on programs they could run. The major goal of West Words is to assist in the creation of a Western Sydney voice, made up of the tapestry of the cultural diversity of the people of the community. Many of the programs they are running are for refugees, migrants and Indigenous young people. West Words makes a huge effort to create publications for their students and their school communities, to both give that voice in writing to the community and a sense of achievement and that they can be authors, creating their own story destiny. West Words engage talented writers in community, like Ned Manning, a dramatist who knows how to play build with students. The Western Sydney model incorporates drama and mentoring opportunities and is developing all the time with programs bringing country and city youth together to understand and interact in writing camps. This model was dynamic and yet their physical space is still just a desk in a building. Libby would still like to have a larger physical centre as well, but they are still trying for that. Libby suggested that Queensland centre for Literature advocates, like West Words, could just keep on developing and documenting how they work in community to keep strengthening a case for a centre. Both Libby and Lesley argued that hands on patrons and board members who really care about the establishment and ongoing viability of the centres are a key in their progress. They have paid staff coordinating the running of their programs. West Words have Bryan Brown as their major patron but also a director who was able to really kickstart the process because of his immense experience. Both Libby and Lesley have been involved in extensive lobbying of politicians to achieve their goals. The third case study was presented by Matt Roden, a writer, designer and educator in Sydney and London and formerly Creative Projects Manager at the Ministry of Stories in London; he shared the projects of Sydney Story Factory http://www.sydneystoryfactory.org.au/ who have an imaginative shopfront which has the fun title of ‘Martian Embassy’ but who also do a lot of their work going out to schools. They are increasingly deemphasising their shop front. All workshops run by Story Factory are free for participants (but importantly key staff are paid) and particularly target marginalised youth. Matt focused on their approach to workshops and gave case studies of projects they had done, and explained to us how they worked. They began by identifying that the three main hurdles to students completing stories, are 1) Wondering where to start 2) Having too many ideas, 3) Having an inner critic that was too strong. In the workshop structure they have three main elements to tackle the three hurdles. They often use mentor texts students are already familiar with from their current curriculum, to encourage imagination, creativity and engagement, thus their creatives visits are then supportive of teachers rather than burdening their curriculum responsibilities. They also give the students a structure to work with. They throw in a fun element for the exercise to feel like it isn’t just the curriculum, it might even be a bit taboo, but is something students can really relate to. With their programs they have up to five hours per student, and would love to be able to increase that. Matt then gave us three case studies of workshops to illustrate the adaptability of the Story Telling Factory into different environments, but this report will share just one – the Donkey Date Game where students wrote a script for a reality tv show which was about people going on a series of blind dates, but they would be pranked by a character similar to Puck in the original play. Their show was based on the high school set text A Midsummers Night Dream. The writing of the reality tv show helped students to deepen their discussion when they went to interrogate the text in class discussions and made them consider the motivations of the characters pranked in the original play. Matt shared that the Sydney Story Factory are supported by 900 volunteers, who are mostly students and retirees. They make sure their volunteers are engaged, happy and confident and it’s these volunteers enable them to have more people working one on one to mentor students in their writing. The Sydney Story Factory is about to move into doing programs in Western Sydney, which lead to an audience member asking if they would be working with West Words at all in that process. Lachlann shared the story of some of the interesting projects that he along with other collaborators developed in schools, often times focused on the process of creating more than the end product prior to establishing the 100 Story Building. One project was a books in progress in a school, and another was letters between Authors to Students, who were collaborating on writing a story together that was later published in an anthology. Lachlann, felt the 100 story building was not about creating a children’s literature centre in Melbourne, but an interactive space, that belongs and is run by community, and which can partly be a blank canvas they have input into. So some elements of the 100 story building the children themselves invent, like time machines. Both Matt and Lachlan’s major goals with their programs were not directly about creating writers for the future or a writing centre, but more encouraging, literacy, imagination, and confidence, skills that can be applied across different contexts, which may or may not include writing. Yet, their philosophy of how to work in community, by listening, consultation, and creating something the community is a co-creator could easily be applied to a Queensland centre for children’s literature. All of the presenters, shared models where adaptability and ongoing development in response to what works for staff and for the community targets shapes the programs they create. Reflecting on initial mission statements they created, helped them with keeping on track, but sometimes these mission statements changed over time when they knew the local community they were servicing better. Taking into account Lachlan, and Matt’s approaches it would be important to involve more children and their families in the establishment of the goals and shape of a Children’s literature centre as they are perhaps the main stakeholder. The models of West Words and the Literature centre showed immense respect for engaging experienced writers, and paying them and other staff who are knowledgeable and talented to do the job. So another major stakeholder for a Children’s Literature centre, are authors for children who, Lesley strongly argued should be respected and well paid and the best of the best need to be employed to build the reputation of whatever centre you run. She has key paid staff in the centre who are well paid and ‘worth every dollar’ as they are so dedicated. Each of the four approaches includes a board, and a team, with a director or CEO involved and three were incorporated. Yet all of the models, were started by an individual or small groups passion to see it come to be. They see their structure as important to having checks and balances and are most scrupulous with how money they are given for grants is accounted for and spent. All have found experts to serve on their boards, and these experts might have development project experience, financial and other talents that enable their projects to go forward. Aspects of all of the models could be adopted and combined within a Queensland Context, based on whatever works for our local community of writers. Moved by the many questions of the audience which happened after the presentations in an afternoon panel session chaired by University of Southern Queensland, all the presenters in the forum expressed their desire to continue to assist us if the participants should need it, and welcomed visits for anyone to study how they work. There was an enthusiasm amongst those attending the symposium to: continue the conversation about how to create a centre for children’s literature; to think about broadening the number and scope of organisations that might be involved; as well as an acknowledgement that it will take dedicated and visionary individuals and some paid infrastructure to fully initiate the process and a vibrant community team to keep it going.